"Rubber" and "India rubber" redirect here. For other uses, see Rubber (disambiguation). This article is about the polymeric material "natural rubber". For man-made rubber materials, see Synthetic rubber. Natural rubber, also called India rubber or caoutchouc, as initially produced, consists of polymers of the organic compound isoprene, with minor impurities of other organic compounds, plus water. Thailand and Indonesia are two of the leading rubber producers. Forms of polyisoprene that are used as natural rubbers are classified as elastomers. Currently, rubber is harvested mainly in the form of the latex from the rubber tree or others. The latex is a sticky, milky colloid drawn off by making incisions in the bark and collecting the fluid in vessels in a process called "tapping". The latex then is refined into rubber ready for commercial processing. In major areas, latex is allowed to coagulate in the collection cup. The coagulated lumps are collected and processed into dry forms for marketing. Natural rubber is used extensively in many applications and products, either alone or in combination with other materials. In most of its useful forms, it has a large stretch ratio and high resilience, and is extremely waterproof. 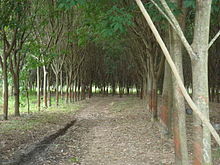 The major commercial source of natural rubber latex is the Pará rubber tree (Hevea brasiliensis), a member of the spurge family, Euphorbiaceae. This species is preferred because it grows well under cultivation. A properly managed tree responds to wounding by producing more latex for several years. Congo rubber, formerly a major source of rubber, came from vines in the genus Landolphia (L. kirkii, L. heudelotis, and L. owariensis). Dandelion milk contains latex. The latex exhibits the same quality as the natural rubber from rubber trees. In the wild types of dandelion, latex content is low and varies greatly. In Nazi Germany, research projects tried to use dandelions as a base for rubber production, but failed. In 2013, by inhibiting one key enzyme and using modern cultivation methods and optimization techniques, scientists in the Fraunhofer Institute for Molecular Biology and Applied Ecology (IME) in Germany developed a cultivar that is suitable for commercial production of natural rubber. In collaboration with Continental Tires, IME began a pilot facility. Many other plants produce forms of latex rich in isoprene polymers, though not all produce usable forms of polymer as easily as the Pará. Some of them require more elaborate processing to produce anything like usable rubber, and most are more difficult to tap. Some produce other desirable materials, for example gutta-percha (Palaquium gutta) and chicle from Manilkara species. Others that have been commercially exploited, or at least showed promise as rubber sources, include the rubber fig (Ficus elastica), Panama rubber tree (Castilla elastica), various spurges (Euphorbia spp. ), lettuce (Lactuca species), the related Scorzonera tau-saghyz, various Taraxacum species, including common dandelion (Taraxacum officinale) and Russian dandelion (Taraxacum kok-saghyz), and perhaps most importantly for its hypoallergenic properties, guayule (Parthenium argentatum). The term gum rubber is sometimes applied to the tree-obtained version of natural rubber in order to distinguish it from the synthetic version. The first use of rubber was by the indigenous cultures of Mesoamerica. The earliest archeological evidence of the use of natural latex from the Hevea tree comes from the Olmec culture, in which rubber was first used for making balls for the Mesoamerican ballgame. Rubber was later used by the Maya and Aztec cultures – in addition to making balls Aztecs used rubber for other purposes such as making containers and to make textiles waterproof by impregnating them with the latex sap. The Pará rubber tree is indigenous to South America. Charles Marie de La Condamine is credited with introducing samples of rubber to the Académie Royale des Sciences of France in 1736. In 1751, he presented a paper by François Fresneau to the Académie (published in 1755) that described many of rubber's properties. This has been referred to as the first scientific paper on rubber. In England, Joseph Priestley, in 1770, observed that a piece of the material was extremely good for rubbing off pencil marks on paper, hence the name "rubber". It slowly made its way around England. In 1764 François Fresnau discovered that turpentine was a rubber solvent. Giovanni Fabbroni is credited with the discovery of naphtha as a rubber solvent in 1779. South America remained the main source of latex rubber used during much of the 19th century. The rubber trade was heavily controlled by business interests but no laws expressly prohibited the export of seeds or plants. In 1876, Henry Wickham smuggled 70,000 Pará rubber tree seeds from Brazil and delivered them to Kew Gardens, England. Only 2,400 of these germinated. Seedlings were then sent to India, British Ceylon (Sri Lanka), Dutch East Indies (Indonesia), Singapore, and British Malaya. Malaya (now Peninsular Malaysia) was later to become the biggest producer of rubber. In the early 1900s, the Congo Free State in Africa was also a significant source of natural rubber latex, mostly gathered by forced labor. King Leopold II's colonial state brutally enforced production quotas. Tactics to enforce the rubber quotas included removing the hands of victims to prove they had been killed. Soldiers often came back from raids with baskets full of chopped-off hands. Villages that resisted were razed to encourage better compliance locally. See Atrocities in the Congo Free State for more information on the rubber trade in the Congo Free State in the late 1800s and early 1900s. Liberia and Nigeria started production. In India, commercial cultivation was introduced by British planters, although the experimental efforts to grow rubber on a commercial scale were initiated as early as 1873 at the Calcutta Botanical Gardens. The first commercial Hevea plantations were established at Thattekadu in Kerala in 1902. In later years the plantation expanded to Karnataka, Tamil Nadu and the Andaman and Nicobar Islands of India. India today is the world's 3rd largest producer and 4th largest consumer. In Singapore and Malaya, commercial production was heavily promoted by Sir Henry Nicholas Ridley, who served as the first Scientific Director of the Singapore Botanic Gardens from 1888 to 1911. He distributed rubber seeds to many planters and developed the first technique for tapping trees for latex without causing serious harm to the tree. Because of his fervent promotion of this crop, he is popularly remembered by the nickname "Mad Ridley". Charles Goodyear developed vulcanization in 1839, although Mesoamericans used stabilized rubber for balls and other objects as early as 1600 BC. Before World War II significant uses included door and window profiles, hoses, belts, gaskets, matting, flooring and dampeners (antivibration mounts) for the automotive industry. The use of rubber in car tires (initially solid rather than pneumatic) in particular consumed a significant amount of rubber. Gloves (medical, household and industrial) and toy balloons were large consumers of rubber, although the type of rubber used is concentrated latex. Significant tonnage of rubber was used as adhesives in many manufacturing industries and products, although the two most noticeable were the paper and the carpet industries. Rubber was commonly used to make rubber bands and pencil erasers. Rubber produced as a fiber, sometimes called 'elastic', had significant value to the textile industry because of its excellent elongation and recovery properties. For these purposes, manufactured rubber fiber was made as either an extruded round fiber or rectangular fibers cut into strips from extruded film. Because of its low dye acceptance, feel and appearance, the rubber fiber was either covered by yarn of another fiber or directly woven with other yarns into the fabric. Rubber yarns were used in foundation garments. While rubber is still used in textile manufacturing, its low tenacity limits its use in lightweight garments because latex lacks resistance to oxidizing agents and is damaged by aging, sunlight, oil and perspiration. The textile industry turned to neoprene (polymer of chloroprene), a type of synthetic rubber, as well as another more commonly used elastomer fiber, spandex (also known as elastane), because of their superiority to rubber in both strength and durability. Rubber exhibits unique physical and chemical properties. Rubber's stress–strain behavior exhibits the Mullins effect and the Payne effect and is often modeled as hyperelastic. Rubber strain crystallizes. Due to the presence of weakened allylic C-H bonds in each repeat unit, natural rubber is susceptible to vulcanisation as well as being sensitive to ozone cracking. The two main solvents for rubber are turpentine and naphtha (petroleum). Because rubber does not dissolve easily, the material is finely divided by shredding prior to its immersion. An ammonia solution can be used to prevent the coagulation of raw latex. Rubber begins to melt at approximately 180 °C (356 °F). On a microscopic scale, relaxed rubber is a disorganized cluster of erratically changing wrinkled chains. In stretched rubber, the chains are almost linear. The restoring force is due to the preponderance of wrinkled conformations over more linear ones. For the quantitative treatment see ideal chain, for more examples see entropic force. Cooling below the glass transition temperature permits local conformational changes but a reordering is practically impossible because of the larger energy barrier for the concerted movement of longer chains. "Frozen" rubber's elasticity is low and strain results from small changes of bond lengths and angles: this caused the Challenger disaster, when the American Space Shuttle's flattened o-rings failed to relax to fill a widening gap. The glass transition is fast and reversible: the force resumes on heating. The parallel chains of stretched rubber are susceptible to crystallization. This takes some time because turns of twisted chains have to move out of the way of the growing crystallites. Crystallization has occurred, for example, when, after days, an inflated toy balloon is found withered at a relatively large remaining volume. Where it is touched, it shrinks because the temperature of the hand is enough to melt the crystals. Vulcanization of rubber creates di- and polysulfide bonds between chains, which limits the degrees of freedom and results in chains that tighten more quickly for a given strain, thereby increasing the elastic force constant and making the rubber harder and less extensible. Raw rubber storage depots and rubber processing can produce malodour that is serious enough to become a source of complaints and protest to those living in the vicinity. Microbial impurities originate during the processing of block rubber. These impurities break down during storage or thermal degradation and produce volatile organic compounds. Examination of these compounds using gas chromatography/mass spectrometry (GC/MS) and gas chromatography (GC) indicates that they contain sulphur, ammonia, alkenes, ketones, esters, hydrogen sulphite, nitrogen, and low molecular weight fatty acids (C2-C5). When latex concentrate is produced from rubber, sulphuric acid is used for coagulation. This produces malodourous hydrogen sulphide. The industry can mitigate these bad odours with scrubber systems. Chemical structure of cis-polyisoprene, the main constituent of natural rubber. Synthetic cis-polyisoprene and natural cis-polyisoprene are derived from different precursors, isopentenyl pyrophosphate and isoprene. Latex is the polymer cis-1,4-polyisoprene – with a molecular weight of 100,000 to 1,000,000 daltons. Typically, a small percentage (up to 5% of dry mass) of other materials, such as proteins, fatty acids, resins, and inorganic materials (salts) are found in natural rubber. Polyisoprene can also be created synthetically, producing what is sometimes referred to as "synthetic natural rubber", but the synthetic and natural routes are different. Some natural rubber sources, such as gutta-percha, are composed of trans-1,4-polyisoprene, a structural isomer that has similar properties. Natural rubber is an elastomer and a thermoplastic. Once the rubber is vulcanized, it is a thermoset. 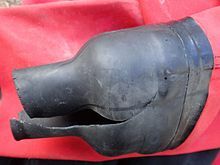 Most rubber in everyday use is vulcanized to a point where it shares properties of both; i.e., if it is heated and cooled, it is degraded but not destroyed. The final properties of a rubber item depend not just on the polymer, but also on modifiers and fillers, such as carbon black, factice, whiting and others. Rubber particles are formed in the cytoplasm of specialized latex-producing cells called laticifers within rubber plants. Rubber particles are surrounded by a single phospholipid membrane with hydrophobic tails pointed inward. The membrane allows biosynthetic proteins to be sequestered at the surface of the growing rubber particle, which allows new monomeric units to be added from outside the biomembrane, but within the lacticifer. The rubber particle is an enzymatically active entity that contains three layers of material, the rubber particle, a biomembrane and free monomeric units. The biomembrane is held tightly to the rubber core due to the high negative charge along the double bonds of the rubber polymer backbone. Free monomeric units and conjugated proteins make up the outer layer. The rubber precursor is isopentenyl pyrophosphate (an allylic compound), which elongates by Mg2+-dependent condensation by the action of rubber transferase. The monomer adds to the pyrophosphate end of the growing polymer. The process displaces the terminal high-energy pyrophosphate. The reaction produces a cis polymer. The initiation step is catalyzed by prenyltransferase, which converts three monomers of isopentenyl pyrophosphate into farnesyl pyrophosphate. The farnesyl pyrophosphate can bind to rubber transferase to elongate a new rubber polymer. The required isopentenyl pyrophosphate is obtained from the mevalonate pathway, which derives from acetyl-CoA in the cytosol. In plants, isoprene pyrophosphate can also be obtained from the 1-deox-D-xyulose-5-phosphate/2-C-methyl-D-erythritol-4-phosphate pathway within plasmids. The relative ratio of the farnesyl pyrophosphate initiator unit and isoprenyl pyrophosphate elongation monomer determines the rate of new particle synthesis versus elongation of existing particles. Though rubber is known to be produced by only one enzyme, extracts of latex host numerous small molecular weight proteins with unknown function. The proteins possibly serve as cofactors, as the synthetic rate decreases with complete removal. More than 28 million tons of rubber were produced in 2017, of which approximately 47% was natural. Since the bulk is synthetic, which is derived from petroleum, the price of natural rubber is determined, to a large extent, by the prevailing global price of crude oil. Asia was the main source of natural rubber, accounting for about 94% of output in 2005. The three largest producers, Thailand, Indonesia (2.4 million tons) and Malaysia, together account for around 72% of all natural rubber production. Natural rubber is not cultivated widely in its native continent of South America due to the existence of South American leaf blight, and other natural predators. Rubber latex is extracted from rubber trees. The economic life period of rubber trees in plantations is around 32 years — up to 7 years of immature phase and about 25 years of productive phase. The soil requirement is well-drained, weathered soil consisting of laterite, lateritic types, sedimentary types, nonlateritic red or alluvial soils. Many high-yielding clones have been developed for commercial planting. These clones yield more than 2,000 kg of dry rubber per hectare per year, under ideal conditions. In places such as Kerala and Sri Lanka where coconuts are in abundance, the half shell of coconut was used as the latex collection container. Glazed pottery or aluminium or plastic cups became more common in Kerala and other countries. The cups are supported by a wire that encircles the tree. This wire incorporates a spring so it can stretch as the tree grows. The latex is led into the cup by a galvanised "spout" knocked into the bark. Tapping normally takes place early in the morning, when the internal pressure of the tree is highest. A good tapper can tap a tree every 20 seconds on a standard half-spiral system, and a common daily "task" size is between 450 and 650 trees. Trees are usually tapped on alternate or third days, although many variations in timing, length and number of cuts are used. "Tappers would make a slash in the bark with a small hatchet. These slanting cuts allowed latex to flow from ducts located on the exterior or the inner layer of bark (cambium) of the tree. Since the cambium controls the growth of the tree, growth stops if it is cut. Thus, rubber tapping demanded accuracy, so that the incisions would not be too many given the size of the tree, or too deep, which could stunt its growth or kill it." It is usual to tap a pannel at least twice, sometimes three times, during the tree's life. The economic life of the tree depends on how well the tapping is carried out, as the critical factor is bark consumption. A standard in Malaysia for alternate daily tapping is 25 cm (vertical) bark consumption per year. The latex-containing tubes in the bark ascend in a spiral to the right. For this reason, tapping cuts usually ascend to the left to cut more tubes. The trees drip latex for about four hours, stopping as latex coagulates naturally on the tapping cut, thus blocking the latex tubes in the bark. Tappers usually rest and have a meal after finishing their tapping work, then start collecting the liquid "field latex" at about midday. The four types of field coagula are "cuplump", "treelace", "smallholders' lump" and "earth scrap". Each has significantly different properties. Some trees continue to drip after the collection leading to a small amount of "cup lump" that is collected at the next tapping. The latex that coagulates on the cut is also collected as "tree lace". Tree lace and cup lump together account for 10–20% of the dry rubber produced. Latex that drips onto the ground, "earth scrap", is also collected periodically for processing of low-grade product. Cup lump rubber coagula in a Myanmar road stall. Cup lump is the coagulated material found in the collection cup when the tapper next visits the tree to tap it again. It arises from latex clinging to the walls of the cup after the latex was last poured into the bucket, and from late-dripping latex exuded before the latex-carrying vessels of the tree become blocked. It is of higher purity and of greater value than the other three types. Tree lace is the coagulum strip that the tapper peels off the previous cut before making a new cut. It usually has higher copper and manganese contents than cup lump. Both copper and manganese are pro-oxidants and can damage the physical properties of the dry rubber. Smallholders' lump is produced by smallholders who collect rubber from trees far from the nearest factory. Many Indonesian smallholders, who farm paddies in remote areas, tap dispersed trees on their way to work in the paddy fields and collect the latex (or the coagulated latex) on their way home. As it is often impossible to preserve the latex sufficiently to get it to a factory that processes latex in time for it to be used to make high quality products, and as the latex would anyway have coagulated by the time it reached the factory, the smallholder will coagulate it by any means available, in any container available. Some smallholders use small containers, buckets etc., but often the latex is coagulated in holes in the ground, which are usually lined with plastic sheeting. Acidic materials and fermented fruit juices are used to coagulate the latex — a form of assisted biological coagulation. Little care is taken to exclude twigs, leaves, and even bark from the lumps that are formed, which may also include tree lace. Earth scrap is material that gathers around the base of the tree. It arises from latex overflowing from the cut and running down the bark, from rain flooding a collection cup containing latex, and from spillage from tappers' buckets during collection. It contains soil and other contaminants, and has variable rubber content, depending on the amount of contaminants. Earth scrap is collected by field workers two or three times a year and may be cleaned in a scrap-washer to recover the rubber, or sold to a contractor who cleans it and recovers the rubber. It is of low quality. Removing coagulum from coagulating troughs. Latex coagulates in the cups if kept for long and must be collected before this happens. The collected latex, "field latex", is transferred into coagulation tanks for the preparation of dry rubber or transferred into air-tight containers with sieving for ammoniation. Ammoniation preserves the latex in a colloidal state for longer periods of time. Latex is generally processed into either latex concentrate for manufacture of dipped goods or coagulated under controlled, clean conditions using formic acid. The coagulated latex can then be processed into the higher-grade, technically specified block rubbers such as SVR 3L or SVR CV or used to produce Ribbed Smoke Sheet grades. Naturally coagulated rubber (cup lump) is used in the manufacture of TSR10 and TSR20 grade rubbers. Processing for these grades is a size reduction and cleaning process to remove contamination and prepare the material for the final stage of drying. The dried material is then baled and palletized for storage and shipment. Natural rubber is often vulcanized - a process by which the rubber is heated and sulfur, peroxide or bisphenol are added to improve resistance and elasticity and to prevent it from perishing. Carbon black is often used as an additive to rubber to improve its strength, especially in vehicle tires, which account for about 70% (~9 million tons) of carbon black production. Natural rubber latex is shipped from factories in south-west Asia, South America, and West and Center Africa to destinations around the world. As the cost of natural rubber has risen significantly and rubber products are dense, the shipping methods offering the lowest cost per unit weight are preferred. Depending on destination, warehouse availability, and transportation conditions, some methods are preferred by certain buyers. In international trade, latex rubber is mostly shipped in 20-foot ocean containers. Inside the container, smaller containers are used to store the latex. Uncured rubber is used for cements; for adhesive, insulating, and friction tapes; and for crepe rubber used in insulating blankets and footwear. Vulcanized rubber has many more applications. Resistance to abrasion makes softer kinds of rubber valuable for the treads of vehicle tires and conveyor belts, and makes hard rubber valuable for pump housings and piping used in the handling of abrasive sludge. The flexibility of rubber is appealing in hoses, tires and rollers for devices ranging from domestic clothes wringers to printing presses; its elasticity makes it suitable for various kinds of shock absorbers and for specialized machinery mountings designed to reduce vibration. Its relative gas impermeability makes it useful in the manufacture of articles such as air hoses, balloons, balls and cushions. The resistance of rubber to water and to the action of most fluid chemicals has led to its use in rainwear, diving gear, and chemical and medicinal tubing, and as a lining for storage tanks, processing equipment and railroad tank cars. Because of their electrical resistance, soft rubber goods are used as insulation and for protective gloves, shoes and blankets; hard rubber is used for articles such as telephone housings, parts for radio sets, meters and other electrical instruments. The coefficient of friction of rubber, which is high on dry surfaces and low on wet surfaces, leads to its use for power-transmission belting and for water-lubricated bearings in deep-well pumps. Indian rubber balls or lacrosse balls are made of rubber. Around 25 million tonnes of rubber are produced each year, of which 30 percent is natural. The remainder is synthetic rubber derived from petrochemical sources. The top end of latex production results in latex products such as surgeons' gloves, condoms, balloons and other relatively high-value products. The mid-range which comes from the technically specified natural rubber materials ends up largely in tires but also in conveyor belts, marine products, windshield wipers and miscellaneous goods. Natural rubber offers good elasticity, while synthetic materials tend to offer better resistance to environmental factors such as oils, temperature, chemicals and ultraviolet light. "Cured rubber" is rubber that has been compounded and subjected to the vulcanisation process to create cross-links within the rubber matrix. Some people have a serious latex allergy, and exposure to natural latex rubber products such as latex gloves can cause anaphylactic shock. The antigenic proteins found in Hevea latex may be deliberately reduced (though not eliminated) through processing. Latex from non-Hevea sources, such as Guayule, can be used without allergic reaction by persons with an allergy to Hevea latex. Some allergic reactions are not to the latex itself, but from residues of chemicals used to accelerate the cross-linking process. Although this may be confused with an allergy to latex, it is distinct from it, typically taking the form of Type IV hypersensitivity in the presence of traces of specific processing chemicals. Natural rubber is susceptible to degradation by a wide range of bacteria[which?]. The bacteria Streptomyces coelicolor, Pseudomonas citronellolis, and Nocardia spp. are capable of degrading vulcanized natural rubber. ^ Legner, Erich Fred. "Rubber and Other Latex Products". University of California, Riverside. ^ Heim, Susanne (2002). Autarkie und Ostexpansion: Pflanzenzucht und Agrarforschung im Nationalsozialismus. Wallstein Verlag. ISBN 978-3-89244-496-1. ^ Burns, Bill. "The Gutta Percha Company". History of the Atlantic Cable & Undersea Communications. Retrieved 14 February 2009. ^ Tully, John (2011). The Devil's Milk: A Social History of Rubber. NYU Press. ISBN 9781583672600. ^ a b "Charles Marie de la Condamine". bouncing-balls.com. ^ Jackson, Joe (2008). The Thief at the End of the World. Viking. ISBN 9780670018536. ^ "Natural rubber in India". Archived from the original on 1 October 2016. ^ Cornelius-Takahama, Vernon (2001). "Sir Henry Nicholas Ridley". Singapore Infopedia. Archived from the original on 4 May 2013. Retrieved 9 February 2013. ^ Leng, Dr Loh Wei; Keong, Khor Jin (19 September 2011). "Mad Ridley and the rubber boom". Malaysia History. Retrieved 9 February 2013. ^ Hosler, D.; Burkett, S.L. ; Tarkanian, M.J. (1999). "Prehistoric polymers: Rubber processing in ancient Mesoamerica". Science. 284 (5422): 1988–1991. doi:10.1126/science.284.5422.1988. PMID 10373117. ^ Slack, Charles (7 August 2002). Noble obsession: Charles Goodyear, Thomas Hancock, and the race to unlock the greatest industrial secret of the nineteenth century. Hyperion. ISBN 978-0-7868-6789-9. ^ "Casing Joint Design" (PDF). Report - Investigation of the Challenger Accident. US Government Printing Office. Retrieved 29 August 2015. ^ Hoven, Vipavee P.; Rattanakaran, Kesinee; Tanaka, Yasuyuki (1 November 2003). "Determination of Chemical Components that Cause Mal-Odor from Natural Rubber". Rubber Chemistry and Technology. 76 (5): 1128–1144. doi:10.5254/1.3547792. ^ a b c "Info" (PDF). www.aidic.it. ^ Koyama, Tanetoshi; Steinbüchel, Alexander, eds. (June 2011). "Biosynthesis of Natural Rubber and Other Natural Polyisoprenoids". Polyisoprenoids. Biopolymers. 2. Wiley-Blackwell. pp. 73–81. ISBN 978-3-527-30221-5. ^ Paterson-Jones, J.C.; Gilliland, M.G. ; Van Staden, J. (June 1990). "The Biosynthesis of Natural Rubber". Journal of Plant Physiology. 136 (3): 257–263. doi:10.1016/S0176-1617(11)80047-7. ISSN 0176-1617. ^ Schulze Gronover, Christian; Wahler, Daniela; Prufer, Dirk (5 July 2011). "4. Natural Rubber Biosynthesis and Physic-Chemical Studies on Plant Derived Latex". In Magdy, Elnashar (ed.). Biotechnology of Biopolymers. ISBN 978-953-307-179-4. ^ Xie, W.; McMahan, C.M. ; Distefano, A.J. DeGraw, M.D. ; et al. (2008). "Initiation of rubber synthesis: In vitro comparisons of benzophenone-modified diphosphate analogues in three rubber preducing species". Phytochemistry. 69 (14): 2539–2545. doi:10.1016/j.phytochem.2008.07.011. PMID 18799172. ^ Casey, P.J. ; Seabra, M.C. (1996). "Protein Prenyltransferases". Journal of Biological Chemistry. 271 (10): 5289–5292. doi:10.1074/jbc.271.10.5289. PMID 8621375. ^ Kang, H.; Kang, M.Y. ; Han, K.H. (2000). "Identification of Natural Rubber and Characterization of Biosynthetic Activity". Plant Physiol. 123 (3): 1133–1142. doi:10.1104/pp.123.3.1133. PMC 59076. PMID 10889262. ^ "Overview of the Causes of Natural Rubber Price Volatility". En.wlxrubber.com. 1 February 2010. Archived from the original on 26 May 2013. Retrieved 21 March 2013. ^ "Statistical Summary of World Rubber Situation" (PDF). International Rubber Study Group. December 2018. Archived (PDF) from the original on 5 February 2019. Retrieved 5 February 2019. ^ Dr. Aye Aye Khin. "The Impact of the Changes of the World Crude Oil Prices on the Natural Rubber Industry in Malaysia". World Applied Sciences Journal. ^ Listiyorini, Eko (16 December 2010). "Rubber Exports From Indonesia May Grow 6%–8% Next Year". bloomberg.com. Archived from the original on 4 November 2012. Retrieved 21 March 2013. ^ Keoke, Emory (2003). Encyclopedia of American Indian contributions to the world 15,000 years of inventions and innovations. Checkmark Books. p. 156. ^ This section has been copied almost verbatim from the public domain UN Food and Agriculture Organization (FAO), ecoport.com article: Cecil, John; Mitchell, Peter; Diemer, Per; Griffee, Peter (2013). "Processing of Natural Rubber, Manufacture of Latex-Grade Crepe Rubber". ecoport.org. FAO, Agricultural and Food Engineering Technologies Service. Retrieved 19 March 2013. ^ Basic Rubber Testing. ASTM International. pp. 6–. GGKEY:8BT2U3TQN7G. ^ Horath, Larry (2017). Fundamentals of Materials Science for Technologists: Properties, Testing, and Laboratory Exercises, Second Edition. Waveland Press. ISBN 978-1-4786-3518-5. ^ "Rubber Faqs". Archived from the original on 13 September 2016. ^ a b "Premarket Notification [510(k)] Submissions for Testing for Skin Sensitization To Chemicals In Natural Rubber Products" (PDF). FDA. Retrieved 22 September 2013. ^ "New Type of Latex Glove Cleared". ^ American Latex Allergy Association. "Allergy Fact Sheet". ^ Rook, J.J. (1955). "Microbiological deterioration of vulcanized rubber". Appl. Microbiol. 3: 302–309. ^ Leeang, K.W.H. (1963). "Microbiologic degradation of rubber". J. Am. Water Works Assoc. 53: 1523–1535. ^ Tsuchii, A.; Suzuki, T.; Takeda, K. (1985). "Microbial degradation of natural rubber vulcanizates". Appl. Environ. Microbiol. 50: 965–970. ^ Heisey, R.M. ; Papadatos, S. (1995). "Isolation of microorganisms able to metabolize puri¢ed natural rubber". Appl. Environ. Microbiol. 61: 3092–3097. ^ Jendrossek, D.; Tomasi, G.; Kroppenstedt, R.M. (1997). "Bacterial degradation of natural rubber: a privilege of actinomycetes?". FEMS Microbiology Letters. 150 (2): 179–188. doi:10.1016/s0378-1097(97)00072-4. ^ Linos, A. and Steinbuchel, A. (1998) Microbial degradation of natural and synthetic rubbers by novel bacteria belonging to the genus Gordona. Kautsch. Gummi Kunstst. 51, 496-499. ^ Linos, Alexandros; Steinbuchel, Alexander; Spröer, Cathrin; Kroppenstedt, Reiner M. (1999). "Gordonia polyisoprenivorans sp. nov., a rubber degrading actinomycete isolated from automobile tire". Int. J. Syst. Bacteriol. 49 (4): 1785–1791. doi:10.1099/00207713-49-4-1785. PMID 10555361. ^ Linos, Alexandros; Reichelt, Rudolf; Keller, Ulrike; Steinbuchel, Alexander (October 1999). "A Gram-negative bacterium, identified as Pseudomonas aeruginosa AL98, is a potent degrader of natural rubber and synthetic cis-1,4-polyisoprene". FEMS Microbiology Letters. 182: 155–161. doi:10.1111/j.1574-6968.2000.tb08890.x. ^ Helge B. Bode; Axel Zeeck; Kirsten Plückhahn; Dieter Jendrossek (September 2000). "Physiological and Chemical Investigations into Microbial Degradation of Synthetic Poly(cis-1,4-isoprene)". Applied and Environmental Microbiology. 66 (9): 3680–3685. doi:10.1128/AEM.66.9.3680-3685.2000. PMC 92206. PMID 10966376. Ascherson, Neal (1999). The King Incorporated: Leopold the Second and the Congo. Granta Books. ISBN 978-1-86207-290-9. (1999 Granta edition). Brydson, J.A. (30 November 1988). Rubbery Materials and their Compounds. Springer Netherlands. ISBN 978-1-85166-215-9. Hobhouse, Henry (2005) . Seeds of Wealth: Five Plants That Made Men Rich. Shoemaker & Hoard. pp. 125–185. ISBN 978-1-59376-089-2. Hochschild, Adam (2002). King Leopold's Ghost: A Story of Greed, Terror, and Heroism in Colonial Africa. Pan. ISBN 978-0-330-49233-1. Morton, M. (2013). Rubber Technology. Springer Science & Business Media. ISBN 978-94-017-2925-3. Look up natural rubber in Wiktionary, the free dictionary.